The Schilthornbahn takes us effortlessly (in four stages) to the 10,000-foot summit of the Schilthorn in the Berner Oberland. For about $50 per person (there's a double discount for the group rate and for an early morning departure) we ride up and down. Sure that's a lot of money. But when you're surrounded by cut-glass peaks and breathing fresh mountain air, it's one of Europe's great deals. From a value point of view, remember that--all over the Alps--early lifts are discounted and, because of weather patterns, the early birds enjoy the crispest views. The lesson: Pay less and see more by ascending early. On our tours, we do whatever we can to save time. For example, room numbers are assigned on the bus as we approach our hotel. Today, we gave the mic to 12-year-old Annaleise who made sure each tour member knew exactly where they were sleeping. 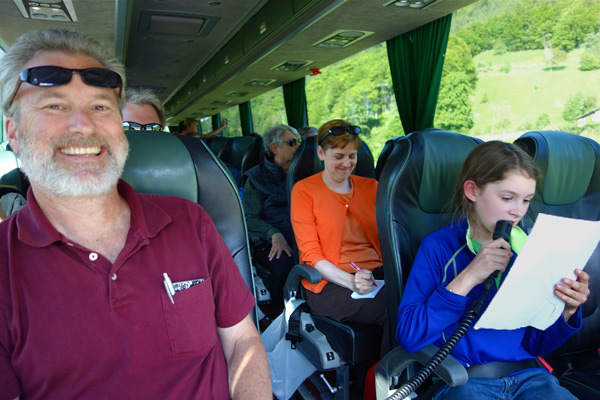 On a Best of Europe in 21 Days tour, we get two days in the Swiss Alps--and the weather is critical. 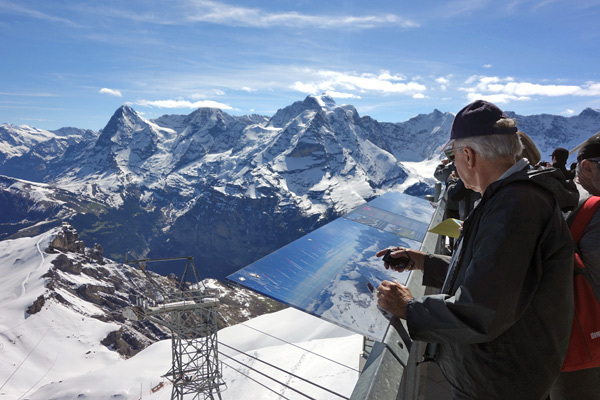 I remember in the early, youth-hostel days of our tour company, we'd wait until morning before deciding if we'd ride the expensive lift to the top of the Schilthorn in the Berner Oberland. It depended on the weather. I'd wake up at the crack of dawn. If it was cloudy, I'd go back to bed--and we'd all sleep in. If the weather was good, I'd wake everyone up, and we were off for the summit. Any guide knows it often clouds up by late morning. Today, we caught the early gondola, were blessed with glorious weather, and enjoyed this view from 10,000 feet. 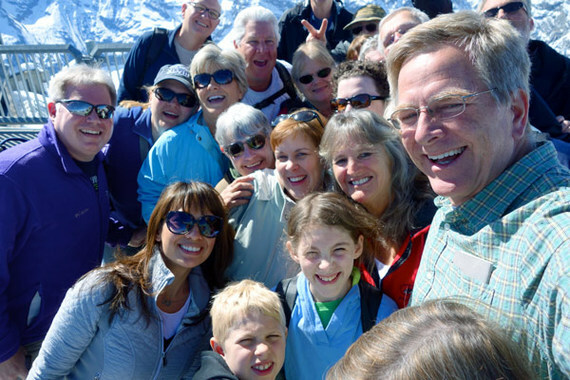 Tour groups love group shots. I find the regimented "short people in front," soccer-team-type photos boring. And, invariably, the stranger you pick to take the photograph frames it crazily, and the shot is too much feet and sky. Lately, my antidote to that is a group selfie. For some reason, as we all try to crowd into the shot (and I hold the camera high to make our chins seem nice and tight), everyone looks as happy as we are.